Aras-Muillian in Duncormick, near Kilmore Quay, County Wexford sleeps 8 people. 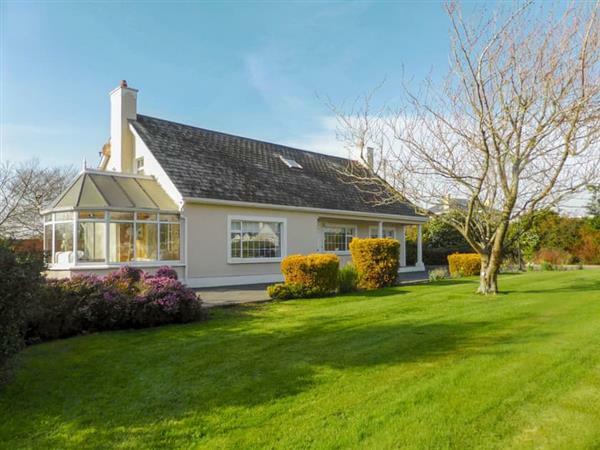 Aras-Muillian near County Wexford is surrounded by pristine landscaped gardens; this beautifully-appointed, detached property offers an amazing amount of space inside, with no fewer than seven reception rooms, perfect for families and groups alike. Outside, the large private grounds have numerous places to sit, making the most of each aspect on those long summer days and ideal for relaxing and recouperating. The nearby riverside village of Duncormick, 1 mile, lies on the Bannow Drive, a tourist trail and signposted route through four picturesque Wexford villages, including Cullenstown, 3½ miles, with its beach which overlooks Ballyteigue Burrow Nature Reserve and Keeragh Island, and has a ball alley which both locals and tourists use to play handball, tennis, squash and football. There are scenic walks in the locality including St Clomaun’s Way, a 1½km riverside walk which arrives at a 17th-century holy well. There is so much to do and see within a 30-minute drive, including the vibrant town of Wexford, Rosslare Strand and harbour, Johnstown Castle, Hook Lighthouse, Wexford Heritage Park and Wexford Wildfowl Reserve. Boat trips can be taken from the picturesque ’thatched village’ of Kilmore Quay, 8 miles, to the remote Saltee Islands, which have one of the world’s major bird sanctuaries. They are home to gannets, puffins and Manx shearwaters, as well as a colony of grey seals, it is truly a memorable day out. Aras-Muillian is a luxurious base from which to explore this sunny southeast corner of Ireland. The beach is 3½ miles from Aras-Muillian near County Wexford. With the shop, pub and restaurant 1 mile from Aras-Muillian. Approximate distance to Dublin airport is 178 km. Living room 2/kitchen: With electric wood burner, breakfast area, electric oven, electric hob, microwave, fridge/freezer, Freeview TV, wooden floor and French doors leading to patio. Sun room: With patio doors leading to garden. Oil central heating, electricity, bed linen, towels and Wi-Fi included. Initial fuel for open fire included. Welcome pack. Large, enclosed lawned garden with patio and garden furniture. Private parking for 3 cars. No smoking. Please note: There is a step in the garden. Holidays at Aras-Muillian run from Saturday to Saturday. For a better idea of where Aras-Muillian is, you can see Aras-Muillian on the map below. Do you want to holiday near Aras-Muillian (W32414), you can see other cottages within 25 miles of Aras-Muillian; have a look to find your perfect holiday location.